Piaggio Aero Industries is flying into calmer skies after weathering several years of severe storms. A year after moving production from its aging plant at Italy’s Genoa Cristoforo Colombo Airport to its clean-sheet design factory at Clemente Panero International Airport Villanova d’Albenga, about 56 miles southwest, it delivered the first Avanti EVO twin turboprop manufactured at the new $150 million facility. Piaggio’s new CEO, Renato Vaghi, who took over from Carlo Logli in late August, personally handed over the aircraft to Sheikh Khalifa Al Saif, CEO and founder of Al Saif Group in Riyadh, Saudi Arabia. The aircraft will be used as a demonstrator and for on-demand air charter. Al Saif Group also has an option to buy a second EVO configured as a MEDEVAC aircraft. The Al Saif Aviation business enterprise of the group markets the aircraft in Bahrain, Iraq, Kuwait, Oman, Qatar and Saudi Arabia. Al Saif Group supports the aircraft with pilot training and maintenance services through a factory-authorized service center in Saudi Arabia. Since introducing the EVO in 2014, Piaggio has delivered only five production aircraft, one-sixth the original production plan. But this niche player has plenty to offer. With a top speed of 402 KTAS and drag-reducing modifications that increase range by 50 nm, it remains the world’s fastest turboprop and the most fuel-efficient twin-turbine aircraft. EVO also has re-contoured engine nacelles, redesigned exhaust pipes, and new Hartzell scimitar-shaped, five-blade props that slash noise by 5 dBA, or 68%. Cabin sound levels also drop 1 dBA. The aircraft’s 9.1-psi pressurization system provides a 6,600-ft. cabin altitude at the aircraft’s 41,000-ft. maximum cruise altitude. An optional 390-lb.-capacity auxiliary fuel tank boosts range from 1,470 to 1,720 nm. 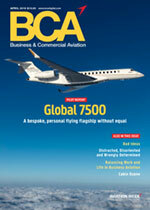 Look for a comprehensive pilot report in an upcoming issue of Business & Commercial Aviation.